When John McAlpine, a British soldier who served at Fort Michilimackinac, retired from his military career in 1774, he was allotted 640 acres of land a couple of miles west of the fort along the Straits of Mackinac. This land passed onto his son, Patrick, in 1802 who Anglicized the name to McGulpin, but was officially deeded to him in 1811. His son, George, and his Native-American wife settled there. The area became known as McGulpin Point. 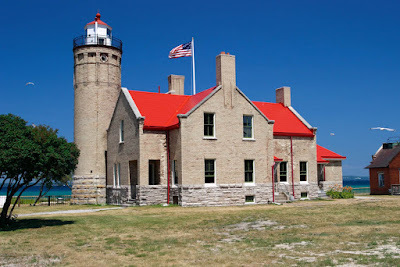 In 1851, the Waugoshance Lighthouse guarded the western entrance to the straits in Lake Michigan and the Bois Blanc Island Lighthouse guarded the east, in Lake Huron, but there was nothing central. Traffic had steadily increased since the opening of the Erie Canal in 1825. In the mid-1850s, the Lighthouse Board wrote of the necessity for a lighthouse at the narrowest point of the straits. Congress appropriated funds for the lighthouse to be built, but until a clear title could be obtained for the land construction was delayed. The appropriations expired and Congress was once again petitioned for funds in 1864. Funds were appropriated a second time, this time for $20,000. 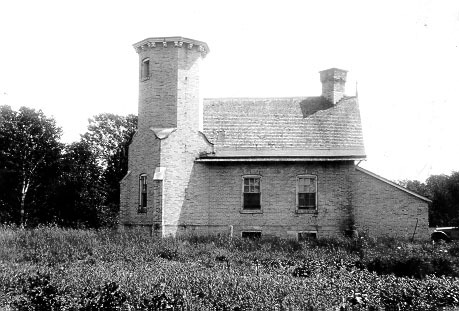 The light station was constructed in what many describe as a Norman-Gothic style in Cream City brick. It opened for service in 1869. The lighthouse keeper’s quarters were contained in a 1 1/2 story house connected to the light tower. The floor plan included a parlor, kitchen and two bedrooms on the main floor. Two bedrooms spanned the upper half story with the addition of a large closet. The tower was set diagonally at one corner and the light at the top consisted of a Third-and-a-half Order Fresnel lens which shone steadily. The same design was used for building several other Great Lakes lighthouses. The head keepers throughout the years of McGulpin Point’s service were as follows: Charles Louisingnau, 1869-1875; Thomas P. Dunn, 1875-1879; Gabrieal Bourissau, 1879; and James Davenport, 1879-1906. Davenport, who notably served last and longest is probably the best-remembered keeper. He faithfully sent weekly reports of the conditions of the Straits of Mackinac, to the District Inspector in Milwaukee. Although he moved his family to town in Mackinaw City during the off-season, so his children could more easily attend school, Davenport trudged through harsh snowy weather in the winter to check conditions on the iced-over straits and make his report each week. Old Mackinac Point Lighthouse is also an example of "Cream City"
clay dug from nearby the city of Milwaukee, Wisconsin. captain of the Waldo A. Avery steered his burning ship towards shore near the McGulpin Point Lighthouse in 1893. At the time, Davenport had gone into Mackinaw City, leaving his nine children behind. They must have learned much as children of the keeper since they made preparations on their own to care for the survivors! When apprised of what was going on at the lighthouse, Davenport rushed back with several Mackinaw City residents in tow. They were able to get out to the beached vessel in a small skiff and make several trips to bring all seventeen crew members safely ashore. Once the Old Mackinac Point Lighthouse and its fog signal had been constructed in 1892, and was more visible along the straits, the Lighthouse Board believed the McGulpin Point station was no longer needed. Still, the lighthouse was in service until November 12, 1906. The Fresnel lens was removed and temporarily stored at Old Mackinac Point Lighthouse. James Davenport was transferred to Old Mission Point and remained there until his retirement in 1917. He then returned to Mackinaw City where he lived until his death at age 85 in 1932. In 1913, the lighthouse was auctioned off and became privately owned. It was being used as a private residence into the 21st century. 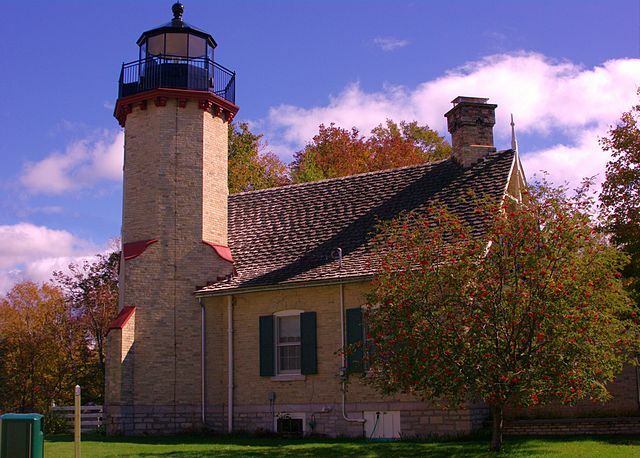 In 2008, the Emmet County commissioners bought the old McGulpin Point Lighthouse. Since then it’s undergone much restoration. There are displays and a gift shop. You can climb the stairs of the restored tower to enter the new tower cap and see the replacement Fresnel lens and the beautiful view. And don’t forget to take the discovery trail down below where you can learn more about the history of the property. McGulpin Point Lighthouse may no longer be a beacon guiding ships on the Straits of Mackinac, but it is a beacon of the past for history lovers. Have you ever thought what it would be like to live in a lighthouse? What is your favorite lighthouse? I’d love to know! Please share in the comments below. 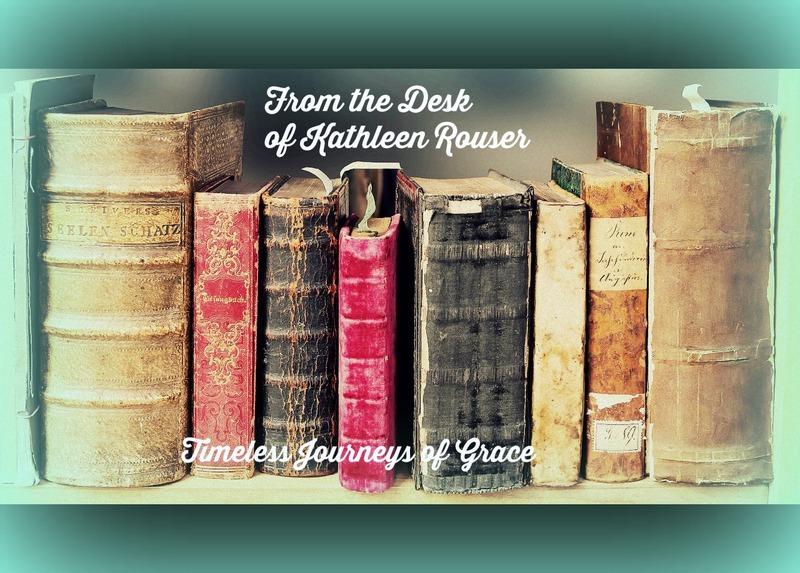 Kathleen Rouser is the award-winning author of Rumors and Promises, her first novel about the people of fictional Stone Creek, Michigan, and its sequel, Secrets and Wishes. Kathleen wanted to be a writer before she could even read. She lives in Michigan with her hero and husband, Jack, and the sassy tailless cat who found a home in their empty nest. Connect with Kathleen on her website at kathleenrouser.com, on Twitter @KathleenRouser. and on Facebook at https://www.facebook.com/kathleenerouser/. Wow! What a story!Thanks for the information. You're welcome. Thank you for stopping by, Connie R.
I love learning about lighthouses. Thanks for the info and the photos. This was an informative and great post about McGulpin Point Lighthouse. Thank you for sharing, Kathleen. Blessings. Glad you enjoyed it, Marilyn. Thank you for stopping by and leaving a comment! Blessings to you as well. Great post Kathleen! Thank you for sharing and including the pictures. I love lighthouses. Years ago I climbed the Cape Hatteras Lighthouse with my two sons. A couple years ago we visited the Currituck Beach Lighthouse, only I did not climb that one as I had both knees replaced not long before so I stayed on the ground and watched as my eldest son and grandson climbed to the top. now. Nice you had those experiences with your sons and grandson. Blessings back to you! My family and I live in Michigan and love to go see the lighthouses when we are near one on vacation. We have been to this lighthouse and so many others. Our hometown, Grand Haven, has a great lighthouse as well. Thanks for sharing all the history. My pleasure, Amanda. My hubby and I are lifelong Michiganders, and I love visiting lighthouses, especially up north, whenever I can. I've visited McGulpin and especially Old Mackinac Point Lighthouse many times.